The CGCN ensures the quality of grapevines across Canada through research and rigorous certification protocols. A commitment to research and grapevine health. CGCN is dedicated to initiating and supporting research into all aspects of grapevine health in Canada. The CGCN works to ensure that Canadian growers and wineries have access to clean, quality grapevine material. Our objective is to ensure a sustainable supply of certified propagative grapevine material. CGCN is committed to conducting research into all aspects of grapevine health. Demonstrate your dedicated to providing high quality domestic grapevine material. CGCN works to advance the Canadian grape and wine industry by ensuring a sustainable supply of high quality, certified propagative grapevine material. The CGCN is a collaboration between the Grape Growers of Ontario, the British Columbia Wine Grape Council, l'Association des vignerons du Québec, and the Grape Growers Association of Nova Scotia. One of the first orders of business for the CGCN is to establish an industry Certification Committee, who will recommend certification standards to the CGCN Board within the next year. Show grape growers your commitment to producing quality propagative grapevine materials with CGCN certification. With CGCN Certification, you can proudly demonstrate to growers that your nursery is dedicated to providing sustainable domestic grapevine material of the highest quality, that has been vetted and tested free from virus. Stay up to date on what's new with the Canadian Grapevine Certification Network. 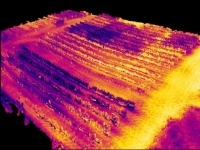 Pat Bowen of Agriculture & Agri-Food Canada explore using GIS tools for vineyard management.